Are new home renovations in your near future? Whether you’re getting ready to build a master suite addition or maybe just update your front door, it pays to know what kind of return on investment (ROI) your home renovation might deliver. According to Remodeling Magazine’s annual Cost vs Value report, not all home remodeling projects deliver the same bang for the buck. In fact, far from it! 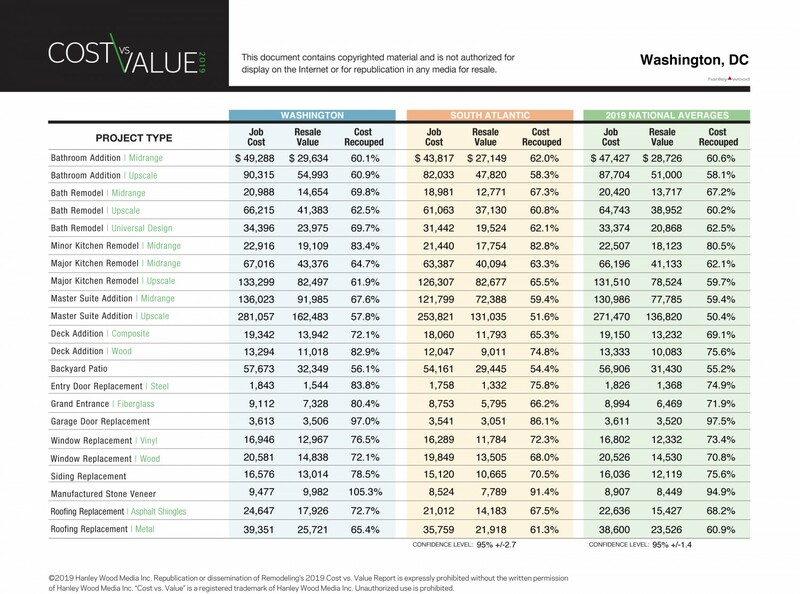 The 2019 Cost vs. Value Report surveyed more than 3,200 industry professionals about returns for 22 popular renovation projects in 136 different U.S. housing markets. View the full report, including project descriptions and city-level data, here. The magazine polled contractors on how much they charge for these jobs, as well as real estate agents on how much they think these features would boost a home’s market price. They then used those figures to calculate a “remodeling ROI” – what percentage of its cost each project might recoup—or not. Broken down by regions, the report found that in 2019 homeowners in the Washington DC area should expect to make back 72.8% of the money they spend on renovations. The chart below helps potential remodeling customers like you understand budget requirements, and the return on investment a homeowner might expect when selling the home based on realtors’ experiences in the area. Manufactured stone veneer, garage doors and entry door replacement being the top finishers. Glamorous? No. Valuable? You bet! And if you’re looking to renovate something indoors this year, Clayton DeKorne, chief editor of the JLC Group (which includes Remodeling magazine) and manager of the report suggests keeping it in the kitchen. While most of the projects with the highest returns are exterior replacements, a minor kitchen repair in the Washington DC area makes the top 5, with an 83.4% recoup. Considering a major kitchen remodel? An upscale kitchen remodel can recoup 61.9% while a midrange can recoup 64.7% of your investment. “When buyers are looking at a house, they want to know the kitchen is something they can live with,” says DeKorne. So which remodeling projects provide the best value to you? While the report is a good benchmark, it’s important to know that the costs used are based on itemized estimates. Therefore, the actual local costs will vary slightly from the costs portrayed in the report, depending on many factors like the overall scope of the project, accessories, finishes, etc. Thomas Custom Builders can assist you with sorting it all out. As a design build firm, our mission is to help you achieve the highest value for the budget through thoughtful design concepts, wise choice of materials, and the application of efficient methods. Contact us today to get started!